these are some of the ones I did yesterday. I'm showing paintings at an Art and Crafts fair in a few weeks and I thought I'd do some cards - most people can't afford the paintings but they can buy cards if they like. I'll do some with prints of my paintings but I thought it would be interesting to do some small abstract collages with fabric, hand made papers, gold tissue and painted papers. Then I scanned them and played a bit more :>) so some will be printed in their new coats. 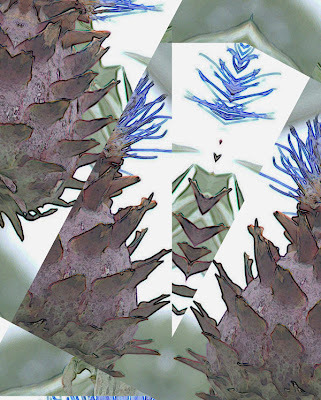 This is a variation in Photoshop on the collage above. These were done from memories of the beach in recent paintings. 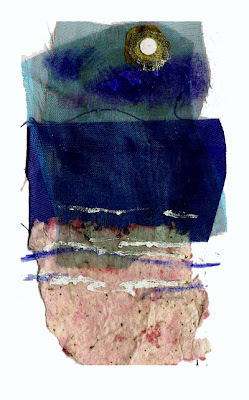 This is collaged from fragments of an overworked painting - at least it was useful for something! and below is a variation on it in Photoshop. and another collage with fragments of the same painting. digital images and photograph copyright Vivien BlackburnI should be getting on with the paintings of C0rnwall in progress and maybe be working on the waterways project - but I'm always juggling lots at once and I wanted to carry on with these digital images I've been working on. I'll upload some of these to my Imagekind account I think and will also give some thought to developing paintings from them. Some would work fantastically well in watercolour - if I'm good enough, not sure if I am though. They would involve careful layering and patience and that isn't something I'm strong on. I'll also try some in mixed media on canvas. watercolour sketchI'm thinking around the canvasses I want to do and how I want to develop them. These first 2 are quick watercolour studies followed by a couple of digital simplifications - I'd like to do some more abstract variations on this view and these are a start on sorting out essential elements. digital manipulationThis last one does really catch the essence of the light without any detail - I rather like it and though it's simplified there are some nice bleeds of colour going on.what do you think?. 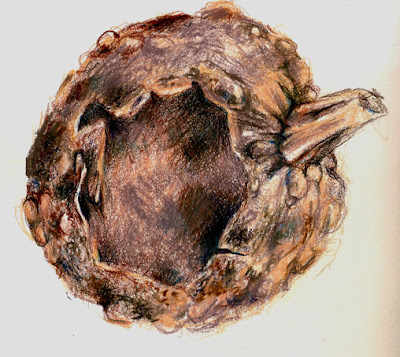 I did another drawing of that gourd to show the class different materials with the same subject. This one was done with that Lyra 'skin tones' set that I really like, plus a deep blue one to enhance the cool darkest darks. I really do like those Lyra coloured pencils. and I've been tagged! 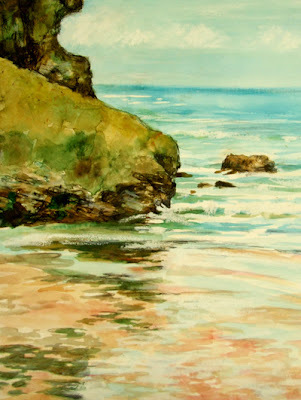 by Karen Hall http://karens-gardenstudio.blogspot.com/ who does some beautiful work - take a look. 6 I've been lucky enough to live in some very beautiful places including Gibraltar (it was lovely then), Malta, Scotland and Cornwall. 7 I'm really tired and I've run out of ideas! I've been working exhaustingly long hours lately, covering for colleagues on holiday and taking on more classes that I should - so not much time for painting :( . 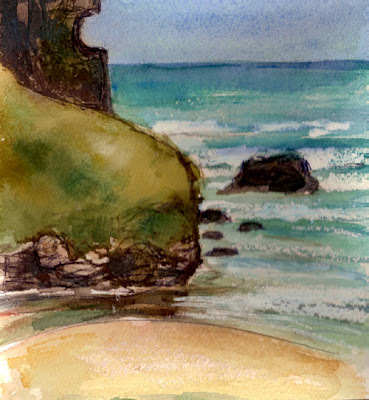 I'm working on the Cornish paintings as much as I can. 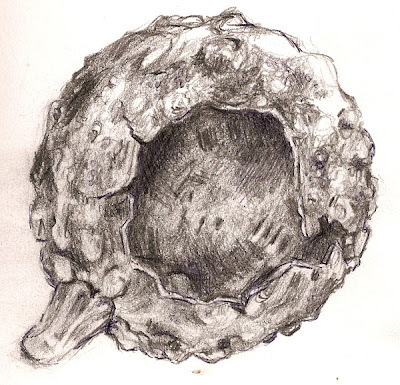 This sketch was done whilst covering a colleagues class yesterday - the class all had work to get on with and didn't need much input from me so I fished this brittle, dried gourd, with a hole in, out of the art cupboard and sat sketching it with a 4B pencil. The roses are still flowering - in a mild winter they carry on virtually all winter - and we've had a few mild winters in recent years. I hope the coming winter is the same, with the lousy summer could it mean a hard winter?The lens as I said before, looks like a filter and simply screws on to the front of the camera - you don't need an SLR. Best of all they are pretty cheap! Beech Leaves - these dry up but stay on until spring. 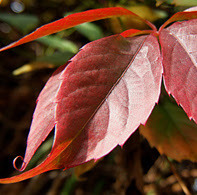 The leaves come out later than most of teh other shrubs/trees in my little garden and I always worry that the frosts have killed it as it sits there covered in last years brown leaves. I think the slide show helps add a little sense of movement to what were crashing, powerful waves. I took the photos to help me remember the patterns of the waves as they curled and broke and crashed against each other and the rocks - watching huge swells coming in and trying to time the click of the shutter to get the spray as the wave hit the cliffs or the curling foam coming from left and right to meet in the middle and the glassy underside of the wave before it crashed down. I'd love to get down to photograph the winter storms when the surf is awesome and terrifying. This is the morning light - the cliffs opposite were lit with a honey/amber glow in the mornings. In the afternoons they were shadowed and darker, almost silhouettes where the rocks are dark. The cliffs reflect in the pools. I did a slide show of waves in Photobucket - but photobucket and blogger don't seem to be talking to each other at the moment :( and now the edit screen is going crazy and not giving me the options I need - I'll try again later. I've been playing with my new 10x macro lens in the garden - autumn and there aren't so many flowers but I'd like to use it on some autumn leaves next. 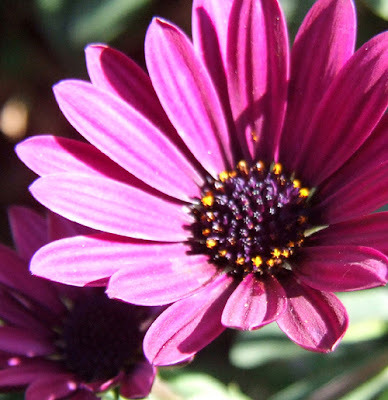 I like osteospermums, they are so generous with their flowers and carry on flowering for such a long time. I've got 2 or 3 slightly different ones - the only problem is the way they close once the sun goes behind the clouds. They really don't like shade at all. This geranium plant is huge and has survived at least 4 winters, left outside in its pot - an old Victorian Chimney Pot. I hope it survives again as it flowers and flowers - right through the winters it kept flowering on, the flowers were small but continuous. It isn't meant to survive the winters! I suppose I should really take some cuttings in case the horrible summer we've had turns into an even worse winter. The lens is a cheap screw on filter-sized magnifying lens. I bought a set that range from 1x to 10x. 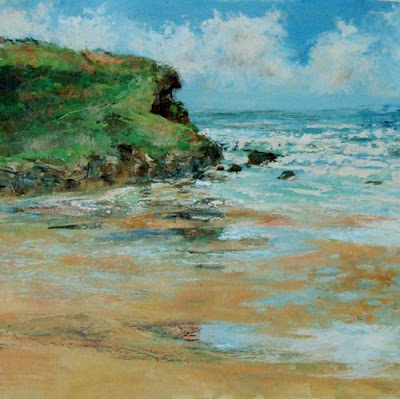 A sketch in oil paint done from our window in Cornwall, looking across the beach as the tide was coming in. Done using Griffin Alkyd oil paints - I really like these for plein air sketching as they dry faster. It was done in a Cryla sketch pad - Cryla pads have a canvas like texture and are designed for acrylics but are just as good for oil paints.